User ManualAnnouncement List User Guide FAQ'SWhat happens when my subscriber's ISP bounces my message? Mail-list.com wants to ensure that all of your subscribers are able to receive your messages. 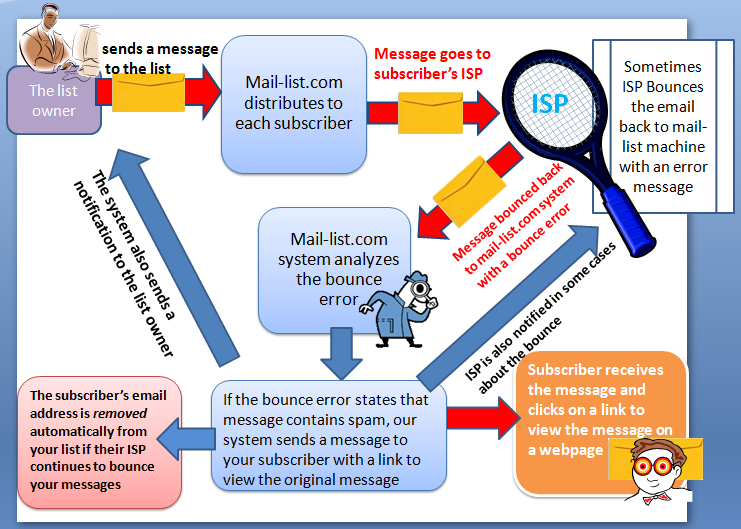 However, sometimes some subscribers' ISPs bounce back messages to our system with a bounce error and the subscribers do not receive the message. For example, the bounce error may state: "The message contains SPAM like characteristics." In that case we follow the BRDS (Bounce Re-delivery System) process. The Bounce Re-delivery System analyzes the bounce error. If the message is rejected due to spam, it sends a message to the subscriber with a link to a webpage where the subscriber can view your original message. We also send a message to you i.e. the list owner advising you about the situation. In most case, the ISP is also notified about the error. The message that we send to your subscriber does not contain your original message, but just a link, therefore the chances are that our message will not get rejected by the ISP. Click here to see an example of a message sent to the subscribers. Click here to see an example of a notification message sent to the list owner. Prev: How do I find the spam folder in AOL Mail? Next: How do I troubleshoot when my message has been bounced by an ISP due to my content or URL being blacklisted?